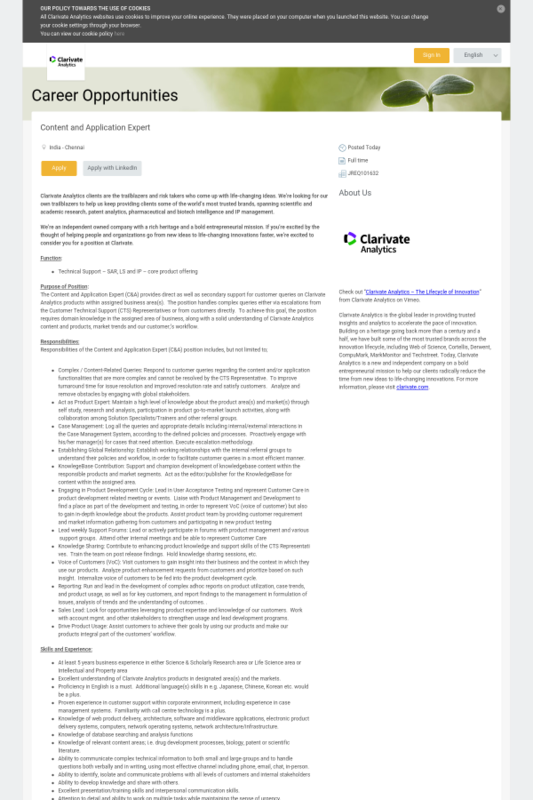 The Content and Application Expert (C&A) provides direct as well as secondary support for customer queries on Clarivate Analytics products within assigned business area(s). The position handles complex queries either via escalations from the Customer Technical Support (CTS) Representatives or from customers directly. To achieve this goal, the position requires domain knowledge in the assigned area of business, along with a solid understanding of Clarivate Analytics content and products, market trends and our customer;’s workflow. Complex / Content-Related Queries: Respond to customer queries regarding the content and/or application functionalities that are more complex and cannot be resolved by the CTS Representative. To improve turnaround time for issue resolution and improved resolution rate and satisfy customers. Analyze and remove obstacles by engaging with global stakeholders. Act as Product Expert: Maintain a high level of knowledge about the product area(s) and market(s) through self study, research and analysis, participation in product go-to-market launch activities, along with collaboration among Solution Specialists/Trainers and other referral groups. Case Management: Log all the queries and appropriate details including internal/external interactions in the Case Management System, according to the defined policies and processes. Proactively engage with his/her manager(s) for cases that need attention. Execute escalation methodology. Establishing Global Relationship: Establish working relationships with the internal referral groups to understand their policies and workflow, in order to facilitate customer queries in a most efficient manner. KnowlegeBase Contribution: Support and champion development of knowledgebase content within the responsible products and market segments. Act as the editor/publisher for the KnowledgeBase for content within the assigned area. Knowledge Sharing: Contribute to enhancing product knowledge and support skills of the CTS Representatives. Train the team on post release findings. Hold knowledge sharing sessions, etc. Voice of Customers (VoC): Visit customers to gain insight into their business and the context in which they use our products. Analyze product enhancement requests from customers and prioritize based on such insight. Internalize voice of customers to be fed into the product development cycle. Reporting: Run and lead in the development of complex adhoc reports on product utilization, case trends, and product usage, as well as for key customers, and report findings to the management in formulation of issues, analysis of trends and the understanding of outcomes. . Sales Lead: Look for opportunities leveraging product expertise and knowledge of our customers. Work with account mgmt. and other stakeholders to strengthen usage and lead development programs. Drive Product Usage: Assist customers to achieve their goals by using our products and make our products integral part of the customers’ workflow. Excellent understanding of Clarivate Analytics products in designated area(s) and the markets. Proficiency in English is a must. Additional language(s) skills in e.g. Japanese, Chinese, Korean etc. would be a plus. Proven experience in customer support within corporate environment, including experience in case management systems. Familiarity with call centre technology is a plus. Knowledge of web product delivery, architecture, software and middleware applications, electronic product delivery systems, computers, network operating systems, network architecture/infrastructure. Knowledge of relevant content areas; i.e. drug development processes, biology, patent or scientific literature. Ability to communicate complex technical information to both small and large groups and to handle questions both verbally and in writing, using most effective channel including phone, email, chat, in-person. Ability to develop knowledge and share with others. Excellent presentation/training skills and interpersonal communication skills. Attention to detail and ability to work on multiple tasks while maintaining the sense of urgency. ‘Research Scholar’ or ‘Research as a vocation’ background in General Scientific disciplines or Life Science area or Intellectual and Property area, preferably with a M. Sc. or Ph. D.